Preesall War Memorial on the B5270 Lancaster Road. OS grid reference SD 3601 4822. This is one of those strange curiosities that do seem to crop up every so often. Haken’s Mound, also known as ‘Haakon’s Mound’ and ‘The Mount’ is, in fact, the Preesall war memorial near St Oswald’s church on the B5270 Lancaster road. The large, grassy mound always has well-tendered flowers at its entrance and up to the monument, and on top of the large mound there is a substantial memorial cross which commemorates the fallen of the two World Wars. According to ‘the’ local legend and, to some extent “myth” Haken or Haakon, an early 10th century Viking chieftain, who settled half a mile or so up the road at Hakensall in Knott-End-On-Sea, was buried inside the mound that is today known as ‘The Mount”. Whether there is any real truth in this I do not know – we will probably never know. 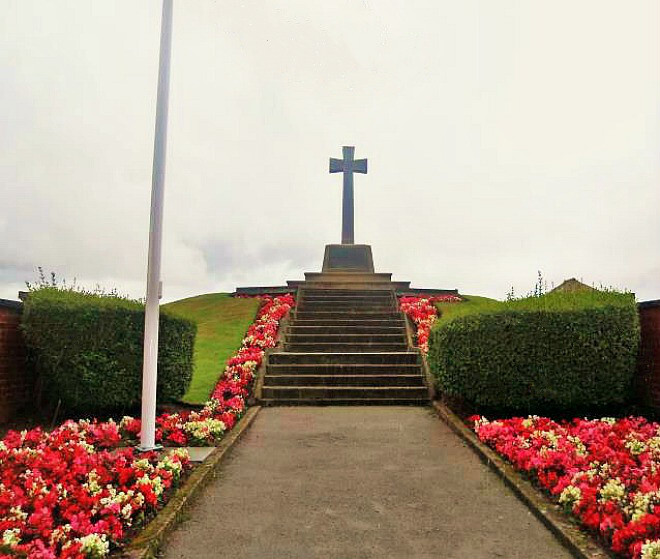 The war memorial is located halfway between St Oswald’s church and the B5377 Stalmine turning, while the very pretty sea-side village of Knott End is half a mile in the opposite direction along Lancaster road. The story goes that: At some point in the early 10th century AD Haken, an invading Viking chieftain, sailed up the Wyre estuary (maybe in a longboat) and, just inland between Fleetwood and Knott End, founded a settlement at a place now called Hackensall – today the medieval Hackensall Hall on Whinny Lane (OS grid ref: SD 2874 5394) stands more or less on that site. The original hall (a defensive moated building) was built in 1190 – the building there today is of 1656; it was built by the Fleetwood family. In the 19th century the hall was greatly renovated by Sir James Bourne. According to “the” Legend, it is said from his settlement Haken laid siege to the area, pillaging and murdering, but I feel that here we have much embellishment added to the actual legend itself – and one “must” be very wary of this fact. Conversely, it may be that Haken was simply a seafaring Norseman who had come to the area and wanted to lead a quiet, unassuming life there. The Mount at Preesall, Lancashire. As to whether Haken or Haakon was still a pagan I don’t know, but I suppose it’s possible that he was a Christian, or had recently become one? After his death this Viking chieftain was buried nearby and a large mound built over his grave. 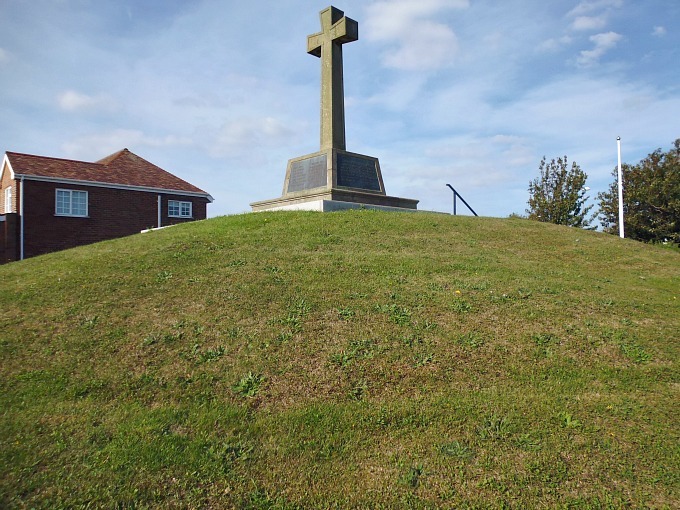 Today this burial mound near St Oswald’s church, Preesall, is locally called ‘The Mount’ or ‘Haakon’s Mound’ and it still looks very impressive, made more so ‘perhaps’ by the war memorial cross standing on top. Alas, today, there are no visible signs (earthworks) of Haken’s settlement at Hackensall, only Hackensall road and Hackensall Hall are reminders. But we will never know archaeologically whether the Viking chieftain lies buried within the mound, due to the fact that it is protected as a war memorial. There are a few historians that have tried to link King Cnut, himself a Norseman, with Knott End with regards to the meaning of the place, but it seems that that is ‘not’ the case as most tend to agree “now” that it takes its name from a “knot”- a hillock that is located above the estuary. This knot or hillock probably refers to the golfcourse above the shoreline at Knott End, just to the north-west of Hackensall Hall. A ghostly horse (boggart) is ‘said’ to haunt the hall. In the delightful little book ‘The Lancashire Coastal Way And The Wyre Way’, by Ian & Krysia Brodie, we are enlightened about the possible meaning of Knott End: “The large sandbank off Knott End is called Bernard’s Wharf – reputedly after St Bernard. Many small birds, including knot and dunlin, feed here in the nutrient-rich mud. One story says Knott End derives from these birds, another that the Norse marked the channel of the Wyre with a chain of knots or cairns, the final one being the Knott End!” There is a church named for St Bernard on Hackensall Road. In 1926 a hoard of Roman coins was dug-up in the vicinity of Hackensall Hall, 500 to be precise, which later came to be known as the Hackensall Hoard. The coins were found beneath a stone and had been placed inside a leather bag. “Whilst the bag was originally found to contain around 500 coins, only 339 now have their whereabouts known” (Ian & Krysia Brodie, 1993). Some of the coin hoard was eventually given to The Revoe Museum in Blackpool, while more coins went to museums and galleries across the north-west of England. Brodie, Ian & Krysia., The Lancashire Coastal Way And The Wyre Way, Lancashire County Books, Preston, 1993. Shotter, D. C. A., Romans in Lancashire, Dalesman Publishing Company Ltd., Clapham, Yorkshire, 1973. Categories: Burial Mound, Misc Subjects, Roman Sites | Tags: Haken's Mound at Preesall in Lancashire | Permalink.